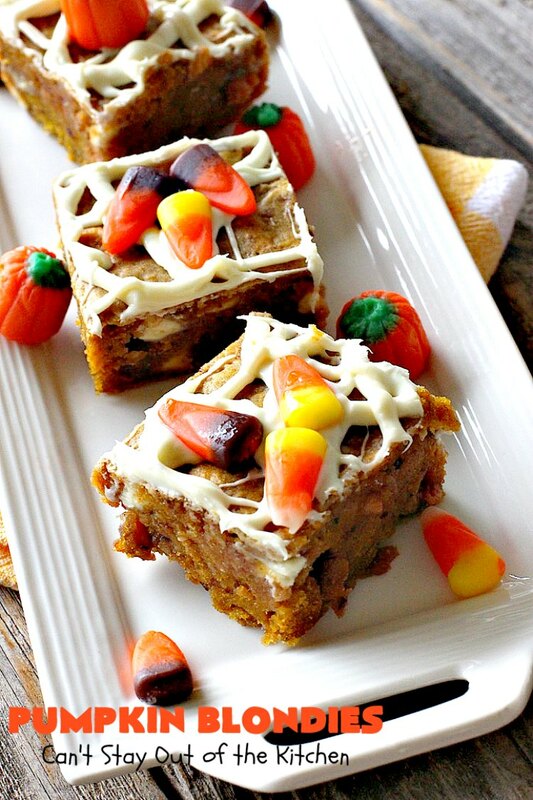 Pumpkin Blondies are sensational–and I mean s-e-n-s-a-t-i-o-n-a-l with a capital “S.” These luscious cookies are made with pumpkin, butterscotch chips, white chocolate chips, pecans and seasoned with cinnamon, allspice, nutmeg and ginger. 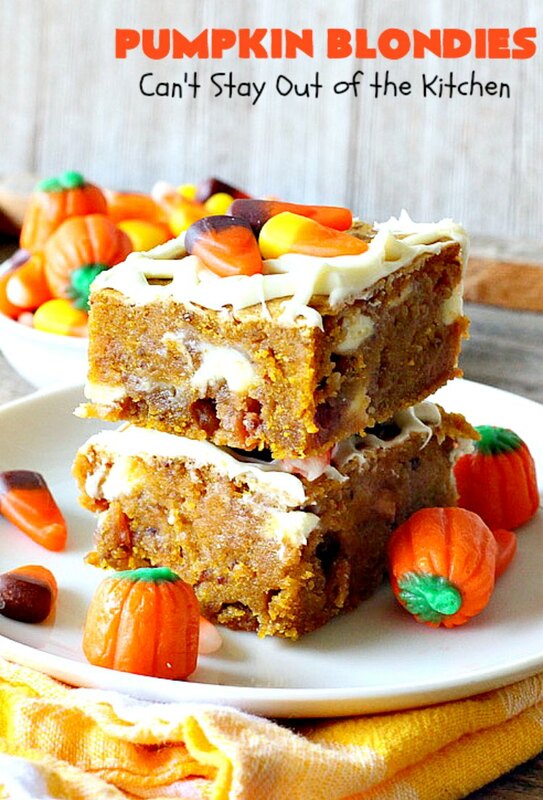 I’m serious, these are some of the BEST dessert bars you’ll ever sink your teeth into. They are truly a pumpkin lover’s delight. I first sampled Pumpkin Blondies at a potluck back in October. I probably had 4 or 5 of them after dinner! 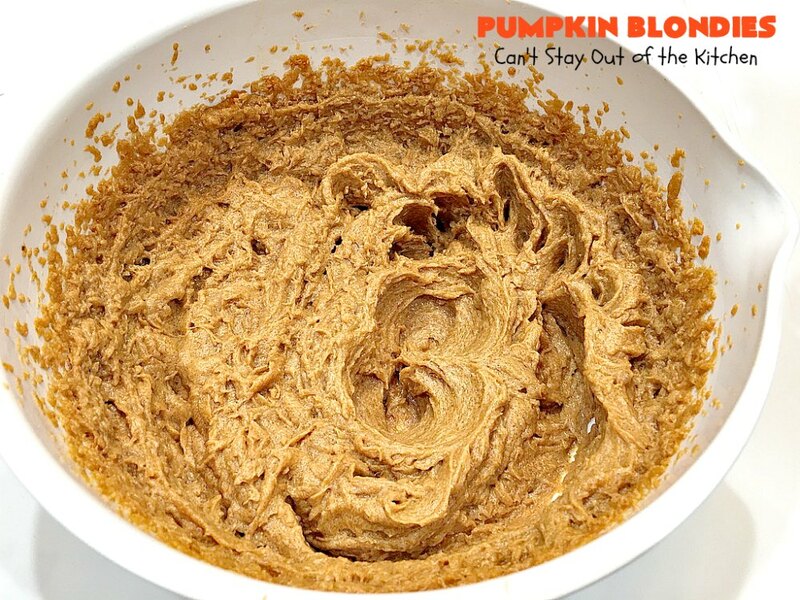 In fact, everyone at the party ate at least 2 or 3 of them. They were so fantastic everyone kept going back for more. 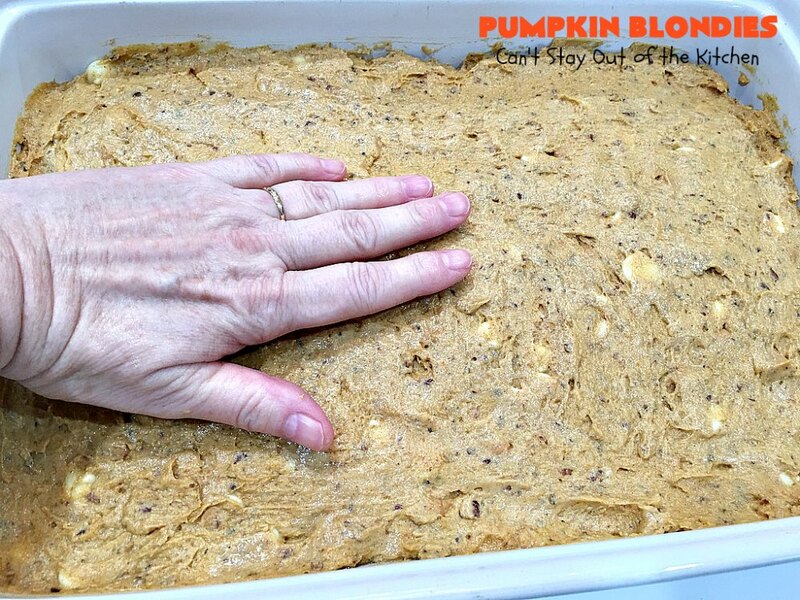 That batch was actually made with gluten free flour because the baker was trying to get rid of it, but I made mine with regular flour. So you can make this recipe gluten free if you choose and it’s just as good. Last month our next door neighbor had gall bladder surgery, so I offered to bring her a meal. She had to have a very special diet, so I made a Butternut Squash Soup & salad with ingredients that she could handle. But I made an Italian Seven Grain Bread and these blondies for her husband and step-daughter. They loved them as much as everyone at the party we’d been to a month earlier. 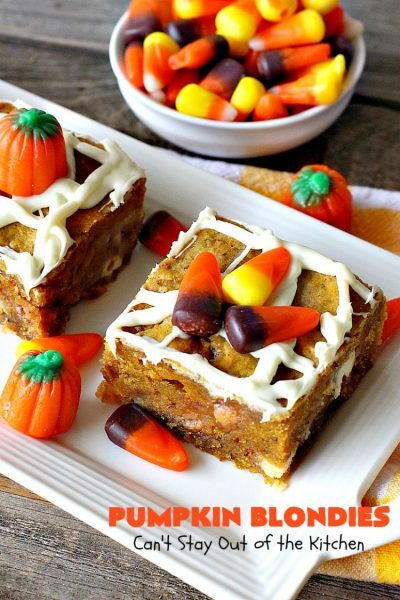 Pumpkin Blondies will satisfy any sweet tooth craving you have. 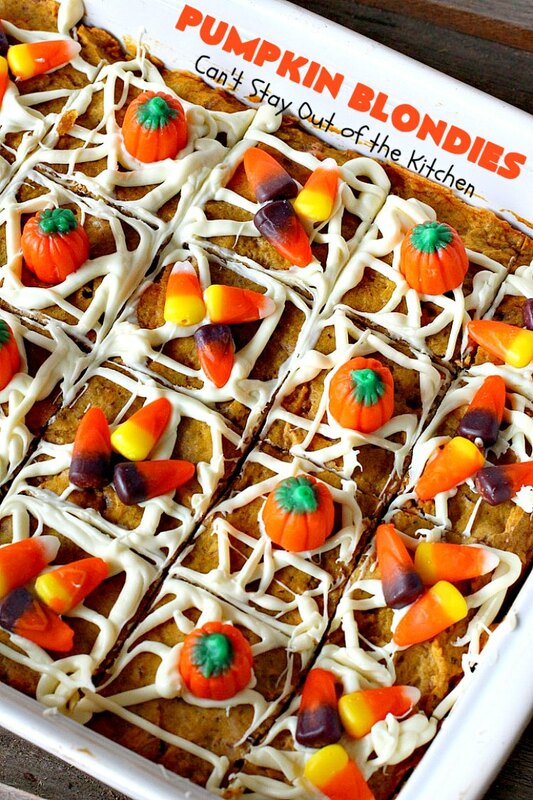 We loved Pumpkin Blondies and think you will too. 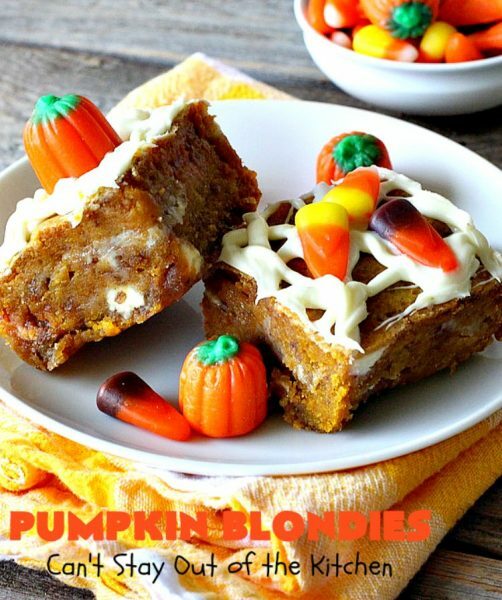 If you enjoy pumpkin desserts, you’ll rave over this one! These are great treats for fall baking or to serve on Thanksgiving menus. Melt butter and cool it. 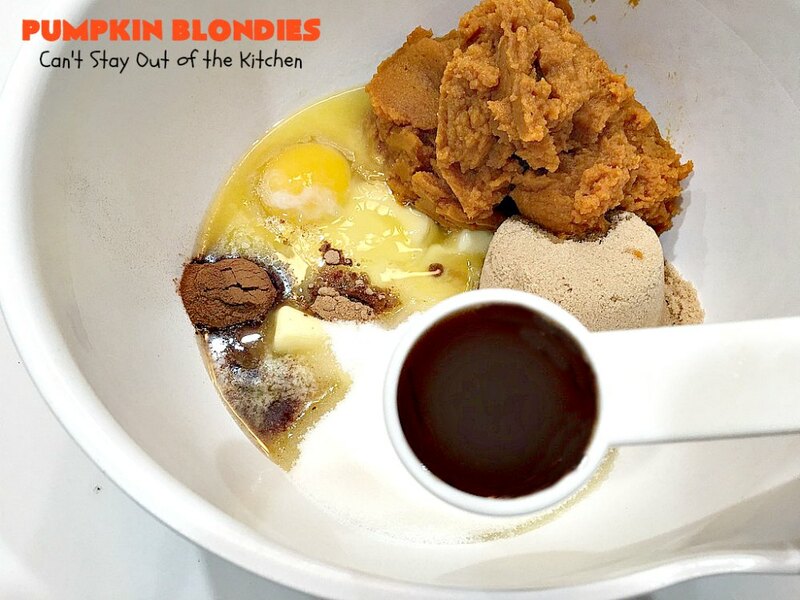 Add egg, pumpkin, sugar, brown sugar, ginger, cinnamon, nutmeg, allspice, salt and vanilla. Add UNBLEACHED all-purpose flour, white chocolate chips, butterscotch chips and pecans. Grease a 9×13″ glass baking dish. 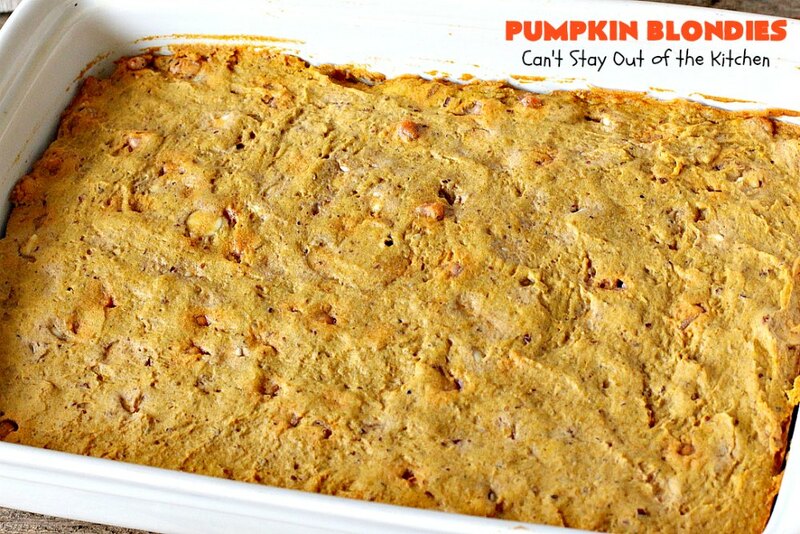 Spread pumpkin mixture into dish. 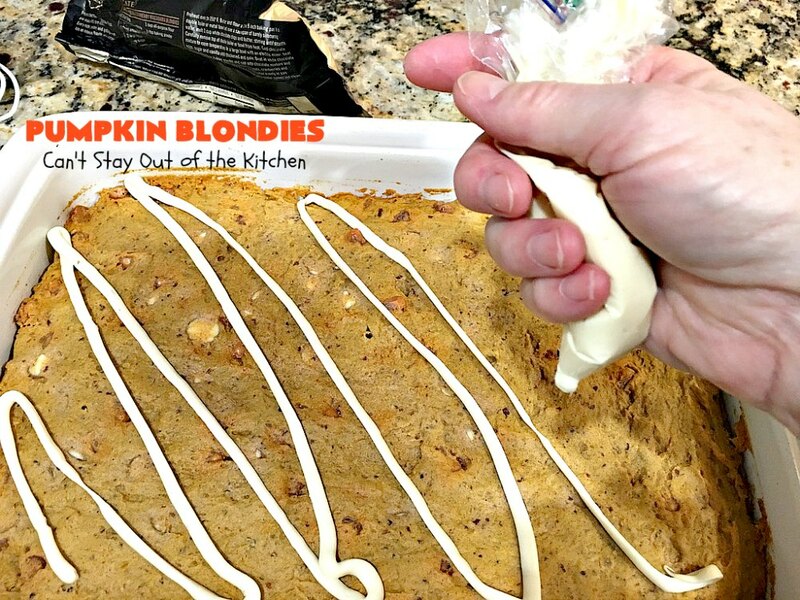 Smooth top with a rubber spatula or your hands. Bake 40-50 minutes at 350 or until a toothpick inserted in center comes out clean. Melt white chocolate chips in microwave. Put icing into a zip lock bag. Cut off a corner and pipe icing over top of cooled blondies. Add candy corns as desired. Take a tray of these goodies to your office and you will find them gone pronto! I kept eating and eating and eating these jewels. 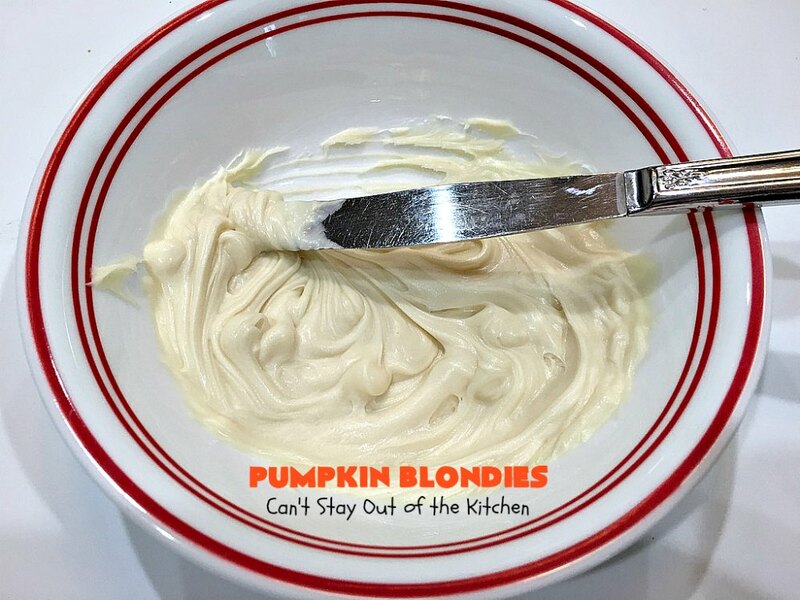 They were so good it was hard to stop! 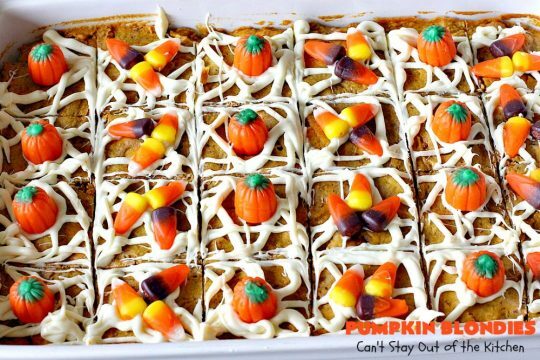 Pumpkin Blondies are ooey, gooey and delicious! 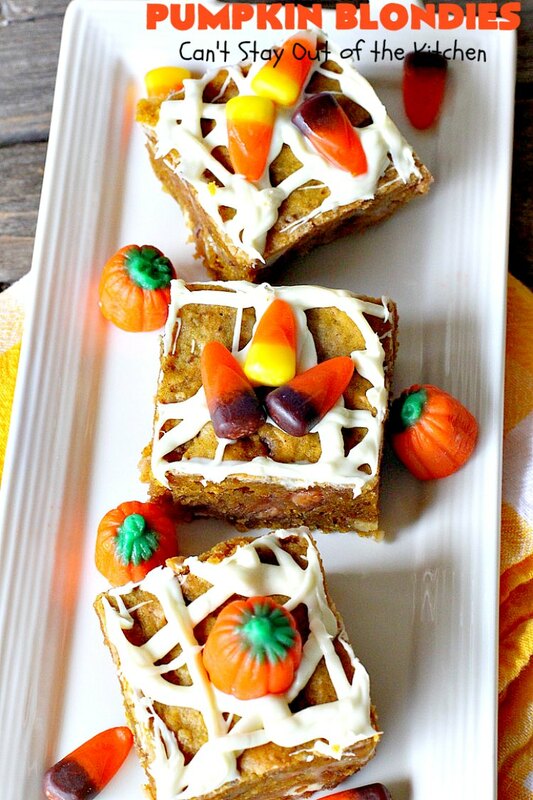 These spectacular Pumpkin Blondies are filled with butterscotch chips, white chocolate chips, pecans and seasoned with cinnamon, allspice, ginger and nutmeg. They make a fantastic dessert bar for fall baking. They're also terrific for holidays like Thanksgiving. 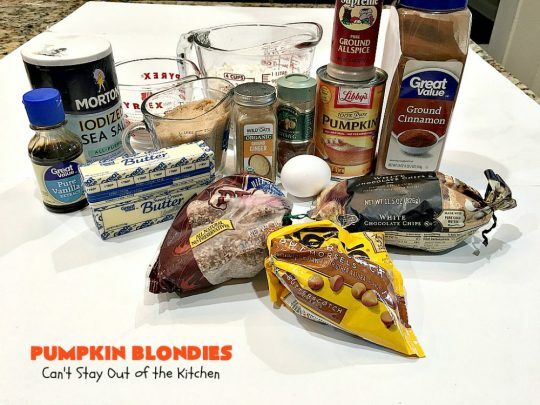 Add to a large mixing bowl with brown sugar, sugar, egg, vanilla, pumpkin, cinnamon, ginger, allspice, nutmeg and salt. 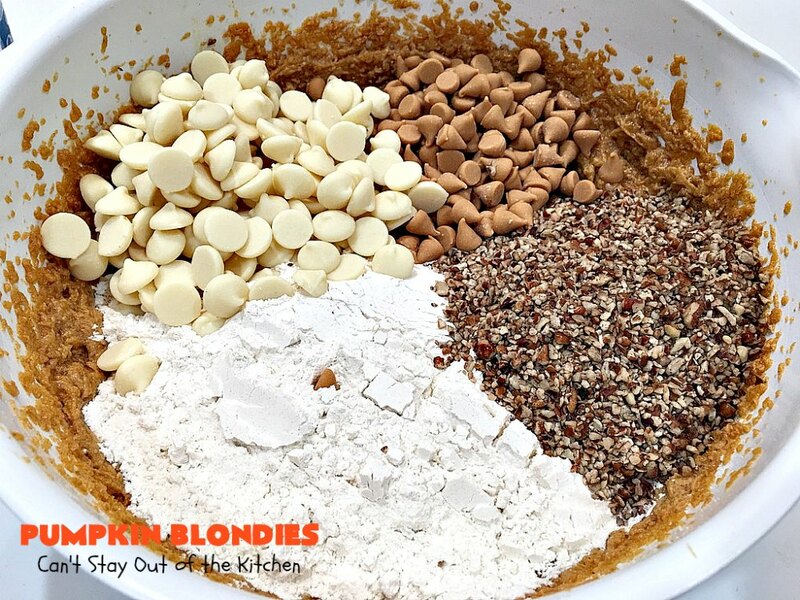 Mix with an electric mixer until ingredients are thoroughly incorporated and mixture is smooth. 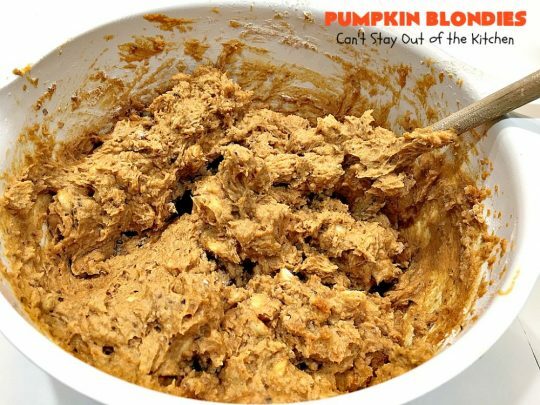 Add flour, butterscotch chips, white chocolate chips and pecans and stir with a wooden spoon to combine. Smooth top with a rubber spatula. Bake at 350° for 40-50 minutes or until a toothpick inserted in center comes out clean. 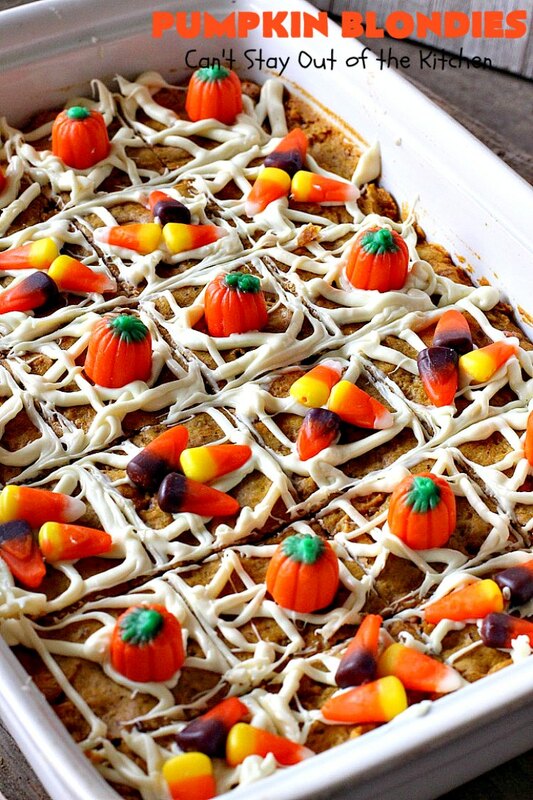 NOTE: These bars taste just as delicious when made with gluten free flour. Recipe adapted from Brown-Eyed Baker. I’ve never made anything with both white chocolate chips and butterscotch chips before, but they work so well together with pumpkin. Every mouthful of these decadent bars will have you drooling. 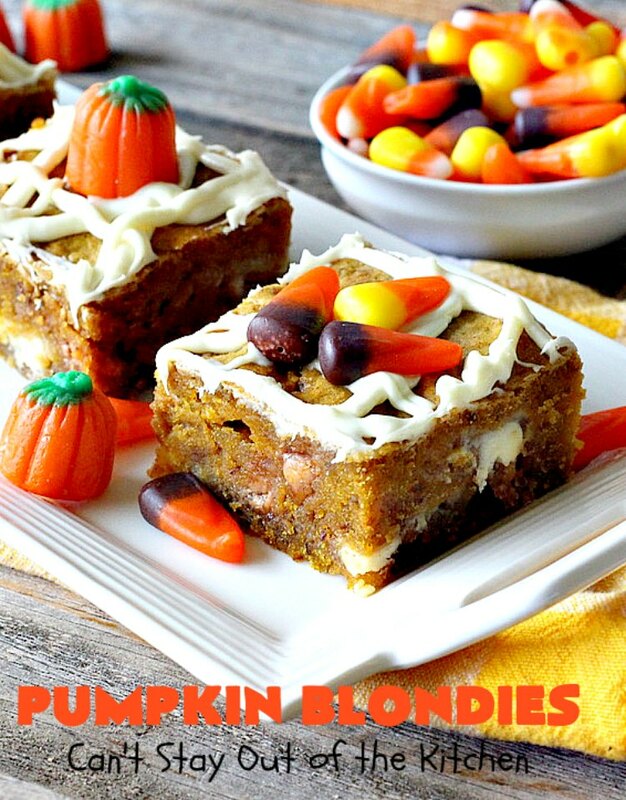 Give Pumpkin Blondies a try. 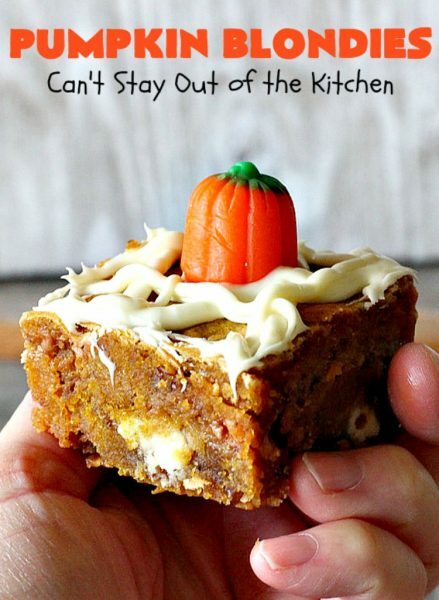 Everyone will want one, or two, or three…..